Soup, curry and chickpeas. They are three of my favourite things and this lovely Creamy Chickpea Curry Soup is now my fourth. It is so creamy and delicious! Chickpeas are a recurrent theme here on AVV. I have so many recipes that involve them. A few of my favourites are my Loaded Taco Fries, my Brownie Batter Dessert Hummus and my New York Cheesecake. They are so versatile and they really come into their own in this soup recipe. This soup is simple to make, full of goodness and very filling thanks to the chickpeas and coconut milk. It is unbelievably rich and creamy and makes the perfect quick and easy dinner or lunch. I haven’t tried it as I don’t have one but I think this soup work work extremely well in an Instant Pot if you have one. Serve a great big, steaming bowl with a warm naan bread or some of my Miracle No Knead Focaccia. If you have any leftover cooked grains in the fridge, such as rice or quinoa, then feel free to add them to the soup in the last ten minutes of cooking. It’s a great way to use them up and will make your meal even heartier. Made from scratch in four very easy steps, this Creamy Chickpea Curry Soup can be ready and on your table within 30 minutes. I just love meals like that during the week don’t you? Settle down to a warm bowl after a busy day and you will be one happy bunny! 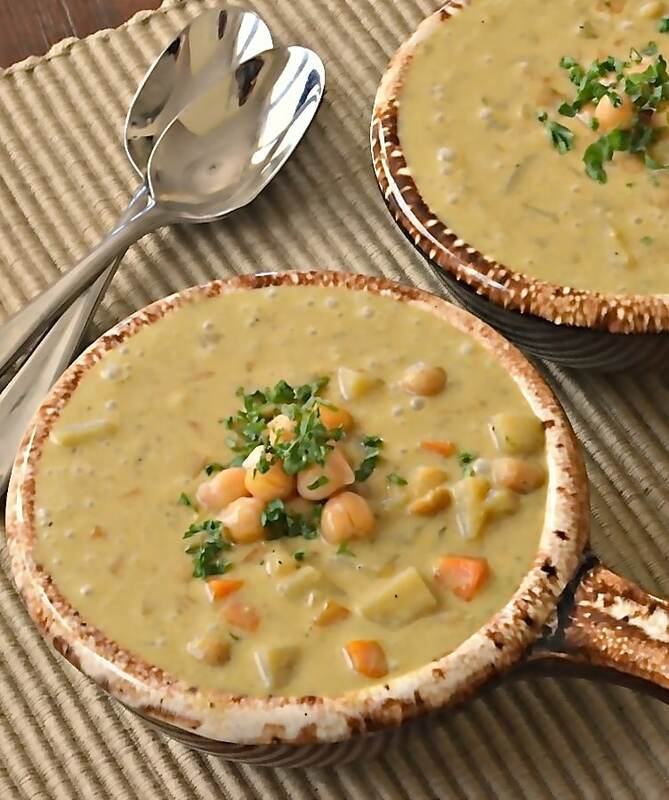 Once you have tried this Creamy Chickpea Curry Soup for yourself, I would love it if you could leave your comments below. You can also share your pictures with me on Instagram (@avirtualvegan). Be sure to add the hashtag #avirtualvegan so I don’t miss them! If you love curry then try my Curry Hummus too. It’s the bomb! Saute the onion until just starting to turn golden brown. Add the carrots, potato, garlic & curry powder and cook for a few more minutes, stirring every 30 seconds or so. Add the stock/water and simmer until the potatoes and carrots are tender (about 10 minutes). At this point if you prefer a thicker, smoother soup, you can remove half, blend it up in a blender, then return it to the pan before continuing with the next step. Add chickpeas, coconut milk and sugar. Simmer over a medium/low heat until hot. This is easy and delicious! We’ve enjoyed this recipe in our home several times now, so thanks! My husband LOVES this soup – I know I can make it a couple times a month and he won’t tire of it. Garbanzo beans are a little waxy for me, so I used cannellini beans instead. I’v stirred in leftover coconut rice and that was really good, too. Thank you so much Valerie. It’s one of my husband’s favorites too! This was delicious and very simple to make! We make this all the time. One of our favourites! Thats so good to hear Julie. Thank you. We love it too! I have been trying to eat healthier so I tried this. It turned out perfectly; delicious and filling. I pureed it a bit with a hand blender to make it a tad smoother. Great recipe! I appreciated how easy and quick it was. Next time I’ll have to try it over rice or with naan. It’s so good with naan bread! I’m so glad you enjoyed it Shannon and thank you for stopping by to leave feedback. It’s much appreciated! The soup is called “creamy” and it does look pureed in the picture. But, the directions do not indicate to puree. I did puree and it was delicious. But, I am curious if the recipe is complete and the soup was not originally intended to be pureed or if the recipe is missing the step of pureeing. Thank you for clarifying. Hi Amy. So glad you enjoyed it! I don’t puree this soup when I make it and it isn’t pureed in the picture. It’s creamy because of the added full fat coconut milk. Also the potatoes break down a bit while cooking and thicken it up further. I like this soup to be chunky. There is nothing to stop you scooping some out and pureeing it, then returning it back to thicken it more though if you want to, or even blending it up completely. I made this last night and liked how it turned out. I’ll add some red chilli powder for an extra kick next time. I also cooked the dry garbanzo beans in my instant pot (45 minutes without soaking) as I don’t like the canned stuff. I just made this in my Instant Pot and it was sooo delicious! I switched it up a bit for the Instant Pot and increased all the ingredients a bit since I had 4 cups of frozen homemade veggie stock and canned beans in the US mainly come in 15 oz tins, so I used 30 oz of beans, 2 cans. I sautéed and simmered in the pot like the recipe says. I then added the chickpeas and coconut milk and pressure cooked for 10 minutes with a quick release. I puréed the whole batch smooth with my immersion blender. Tasted amazing and will be better tommorow night for dinner. Thanks! I’m so glad you enjoyed it and it’s great to know it works well in an Instant Pot. I’ll cook it that way next time I make it! I made this soup tonight with a few modifications. It came out delicious! I keep my fat intake to a minimum so I sautéd the onion and other veggies in water and omitted the coconut milk. I steamed some cauliflower then blended it with part of a can of chick peas. It made the soup nice and creamy. My family and I really liked it! So glad you enjoyed it and were able to adapt it to suit! This soup is amazing and so easy to make. I have made it so many times now. In fact, when I have guests over, I have made this soup because it is so delicious and healthy. I’m so glad you are enjoying the recipe! It’s a firm favourite here too! 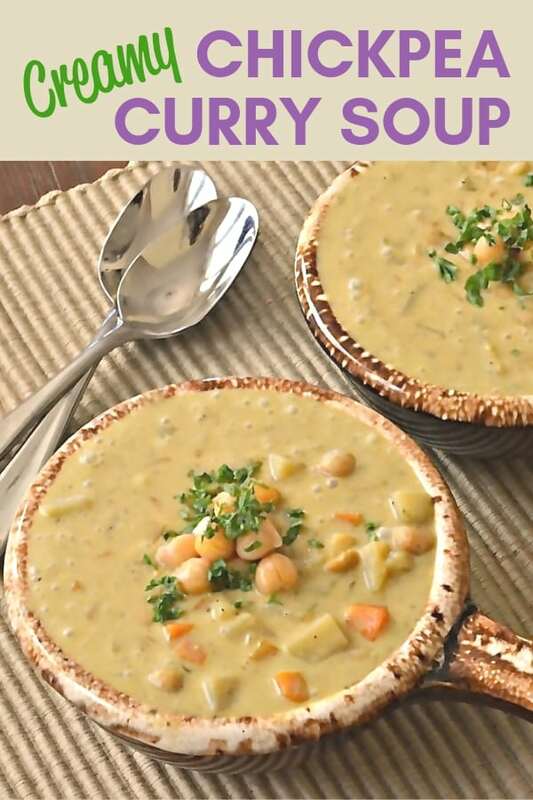 Love the sound of a creamy chickpea soup, but am not a fan of curry at all! Any ideas for other flavours to try? 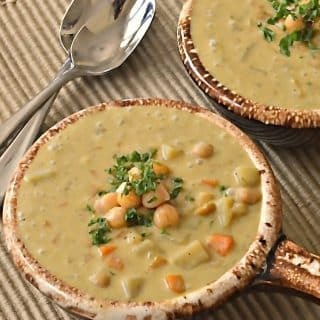 If you were to leave the curry powder out and make sure you use a really nicely flavoured veggie/mushroom broth and perhaps add some dried mixed herbs, or just some thyme or rosemary or a bit of both, you would end up with a really nice creamy vegetable chickpea soup. You could throw in any other veggies you wanted to as well. Some peas would be nice. I think it would be lovely! Great minds think alike ;) Thanks Tabitha! I was looking for an easy chickpea soup recipe and yours came up. It was very good. I did replace the potato with cauliflower only because I wanted a lighter soup. Thank You! So glad you enjoyed it Mark! I am liking the sound of cauliflower instead of potato. I might try that next time I make it. Have you tried to make this in a slow cooker or crockpot? This looks delicious and will definitely try it. Can it be frozen? Thank you Nadine. I have never actually tried freezing it. Coconut milk can be a bit funny when you freeze it and sometimes separates a bit and goes a little grainy. There is a chance that the other ingredients would stabilize it a bit but I’m not totally sure. Next time I make it I will try then update the recipe accordingly. In the meantime it’s up to you if you want to risk it. I am sure it would still be edible just not at its best & perhaps a little grainy. If you do try it before me let me know what happens! any option modifier besides coconut milk? Sorry, I’m not vegan but trying to make at least a vegetarian soup with chickpeas. I have everything but the coconut milk- Im sure its very tasty with coconut milk, but I’m counting calories and sugar levels…I know one can blend a some of the beans to add thickness…but..checking if you have any suggestions. Thanks for sharing! Than You so much! I wound up using a half cup of unsweetened almond milk, a spoon of greek yogurt, and blending up about a half cup worth of the chickpeas/+broth along with a few xtra spices. Turned out great – though I’m sure it may not be as good as with coconut milk we really enjoyed it and really hit the spot on a cold night. The problem with a lot of the canned coconut milk available in my area is that they are high calorie and loaded with sugar. But I understand lower cal/sugar options are available If I really hunt for it…I was just eager to make this last night! Thanks again! You are very welcome. I am glad it turned out well and that you enjoyed it. It’s a regular fixture on our dinner menu here! Excellent! I love it when I see a recipe and have all the ingredients. I hope you love it as much as we do! Loving the sound of this soup. Pretty much ready to get the pot out and make this for dinner tonight! I love adding coconut milk to soup to get that really creamy component! So good! Thanks Vicky. Coconut milk is just the best. I hope you enjoy it! OMG! This is definitely making it to my “Fall Dinners” list. YUM! Glad you like the look of it Prash! Let me know what you think when you make it! Great to hear you enjoyed it Nancy and thank you so much for taking the time to comment! ? Thanks for taking the time to comment Deborah and I am glad you liked it. Extra brownie posts to you for making your own coconut milk! That’s something I haven’t tried yet. Have a great day! I have loads of shredded coconut at home. I make my own nut milk but have never made coconut milk. I will try it next time. Thanks! I do make coconut butter with my shredded coconut though. You might want to try that if you haven’t before. Throw in a food processor and keep going until it turns to butter. It is delicious and keeps forever in a sealed jar. I am curious as to what makes a “mild” curry powder? I have curry powder that was given to me and it came from Trinidad, West Indies. I am wondering if it would work in this recipe? Possibly use only 1/2 a TBSP? I am wanting to make this for supper tonite. Hi Kandy. Any curry powder will work fine in this recipe. I just stated mild as the soup is intended to be mild and creamy rather than spicy and it suits more tastes if it’s mild. As long as it is a curry powder you like then it will be great and yours sounds great! Lucky you to be gifted that! If you don’t mind a stronger flavour then go for the full tbsp or add half then once you have added all of the ingredients have a taste and add a little more if necessary. I hope you enjoy it! Thank you for the quick reply….this soup looks so creamy and luscious. Definitely making it for dinner and will report back! You’re welcome! Look forward to hearing from you later ?